What Is It? : Unlike yesterday’s film, today’s movie limits the apocalypse to a single high school—Vince Lombardi High School to be precise. Naturally, a fatal cocktail of Ramones, truancy, and Clint Howard bring about the destruction. But PJ Soles brings it about with the charismatic warmth of a million suns. She’s great, and so is Mary Woronov as Principal Togar (Booo! Hisss! 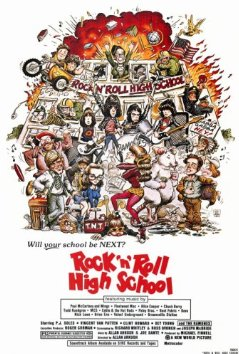 ), but it is Marky Ramone who should have gotten the best supporting actor Oscar for his work in this film. Hand it over, Melvyn Douglas! Why Today? : On this day in 1976, Ramones is released, triggering the spontaneous combustion of thousands of phonographs.